First of all if I want to initialize player with plugin-style, I should write a prototype for it. What does it mean? It means that we just changing source of video-stream and setting current position. In fact we just have a several videos with different quality. They just are several files stored on your server. So when we want to choose another quality we are talking to browser that we want to load another source. volume - property for current volume. You can get and set volume from 0 to 1. The value has float type. So if you want to set 50% of volume then you have to set 0.5.
duration - duration property of video in seconds. 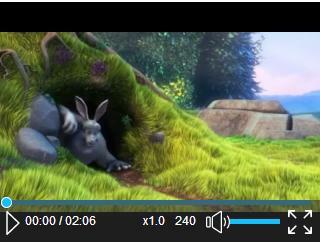 pause - method to pause the video. play - play method. If video was paused then video will continue play from current position. progress - with this event you can show user how much video stream size loaded. loadstart - event will triggered when the source starts to load. loadeddata - event will triggered when the source loaded. timeupdate - with this event you can show progress bar to user for current video position. Based on this info you can create your own video player. Of course you can use ready-to-use plugin :) Also in the plugin I've added more code to handle video position with touches. So when you swipe left or right it change the current position.